Pithier Than Python. Irresistible. Stupendous, Anchorless Joy. Rollicking, Fast-Moving and Hilarious! These are just a few of the reviews garnered by London's longest running comedy. It's an irreverent, fast-paced romp through the Bard’s plays, where just three of CCCT's funniest actors cover thirty-seven Shakespeare plays in less than two hours. 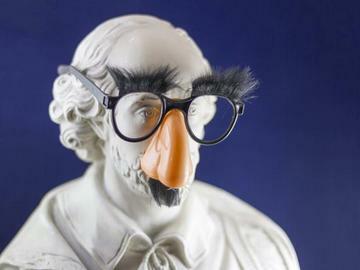 This fast-firing comedy parodies all of the Shakespeare plays (plus the sonnets!) in just two acts. This play is full of energy as the characters run across the stage and keep you guessing how they will pull off the next play. The play starts with an eccentric version of Romeo and Juliet, followed by a parody of Titus Andronicus (which is portrayed as a cooking show). Next is Othello, which is done as a rap song (the infamous “Othello Rap”). The members of the trio compete in a hilarious football game which summarizes the histories (King John, Richard II, Richard III, Henry IV etc), complete with commentary and details of each character's rise and fall from power. As the characters are about to come to the end of the first act, they realize they forgot to perform Hamlet. One of the actors becomes nervous and runs out of the theatre with another actor chasing him. The final actor is left to entertain the audience by himself, which he does by telling jokes and calling for the intermission. After the intermission, the missing two actors return and save their companion from reciting all of the sonnets. All three actors then perform their very abbreviated version of Hamlet (with a little help from the audience), thus “completing” the canon in only an hour and a half! The Complete Works of William Shakespeare (abridged) [revised] performances are on stage at CCCT through April 22nd on Fridays and Saturdays at 8PM and Sundays at 2:30PM. Tickets are on sale now online or call 281-335-5228 for reservations. Tickets are $15 for adults, $13 Students and seniors with group rates available. If you like Shakespeare, you’ll love this show. If you hate Shakespeare you’ll love this show! Don't miss it!